Medoc Mountain State Park rocks the Roanoke Valley! 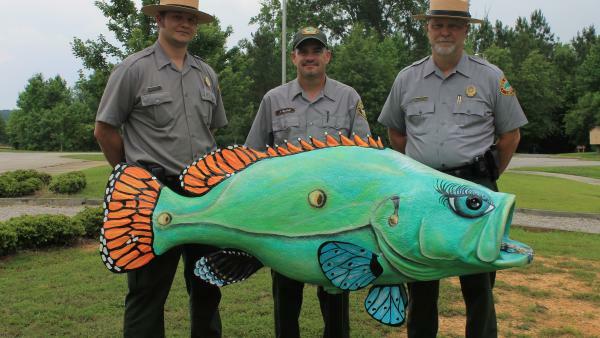 Their fish Luna, painted by local artist Traci Watson, could not be better suited to Halifax County’s own state park. In her mouth is a caterpillar. She is located at the Visitor Center. Medoc Mountain State Park opened in 1975 and now comprises 4,000 acres, is open daily year round with the exception of Christmas Day. The park offers more than 10 miles of hiking trails and more than 12 miles of bridle trails, a 2.5 mile paddle trail on Little Fishing Creek, fishing, picnicking and camping with 34 tent/trailer sites (12 of which are electric) and four group sites. For more information about Medoc Mountain State Park, visit the website or give us a call. To make a campsite reservation, call toll-free. Visitor Center's hours: Monday - Friday from 8 a.m. to 5:00 p.m.. Summer hours: June 1 – August 31, 8 a.m. to 9 p.m.